Helmut’s Big Day. Image credit: James Wade. An interview with James Wade. Absurd soldier comedy. Hi guys. 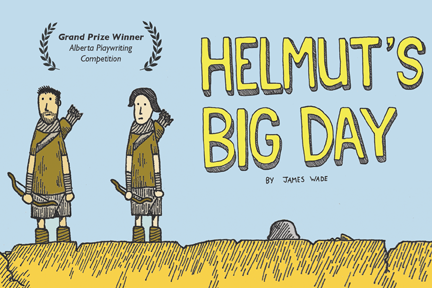 Helmut’s Big Day is a one-act comedy about two soldiers who spend every day patrolling the ancient wall that separates their glorious Great Plain from the barbarous Barren Plain. Only…they’ve forgotten which side is which. When they see a rider approaching from each direction they realize they may have a chance to save their honour and their empire. And one of them keeps talking to his helmet. Helmut’s Big Day sounds hilarious – where did the idea for it come from? I’m a big fan of stories about two idiots who manage to stumble upon profound ideas through their antics (think Rosencrantz and Guildenstern in the Stoppard play) and I thought this idea was perfect for that kind of story. It also comes from reading a lot of Tom Gauld comics. He’s a Scottish cartoonist who comes up with these great, deadpan, minimalist comics that treat some serious themes with a comedic ambivalence. His book Goliath was a huge inspiration. What was it like to be part of the Alberta Playwrights Network Alberta Playwriting Competition? Oh man, it was a trip! I certainly did not expect a silly script like this to win anything. A lot of playwrights I admire gained recognition through this competition so it’s an honour and a nice boost to an emerging playwright to be mentioned among writers like Vern Thiessen and Stephen Massicotte. APN has been amazingly supportive. It was actually during their Playworks Ink conference in 2013 that I began developing a five-page script that eventually became this play. What’s it like to see your play being produced? Is there anything that you’ve discovered/rediscovered about the play throughout mounting this production? It’s great to see it get produced! I think Fringe audiences are going to have a lot of fun with it. My collaborators are pretty brilliant people so I’ve been adjusting the script a bit as we go. Their insights have made me think harder about the characters and have inspired some new dialogue I’m really happy with. There’s pancakes. There’s no pancakes. I shouldn’t have said that. But there’s some cartoonish simulated violence, which is like visual pancakes. Edmonton, eh? My friend Willie Banfield is part of Accidental Humour. He’s been really great about giving us advice about navigating Fringe producing and its been very helpful. Accidental Humour’s new show, Release The McCrackin (also at the Fringe), is going to be awesome.